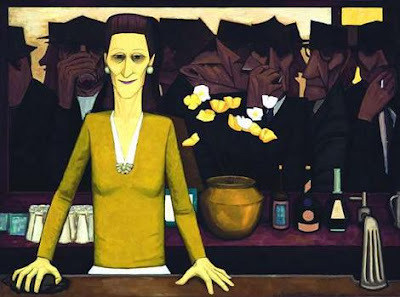 John Brack made me move to Melbourne. 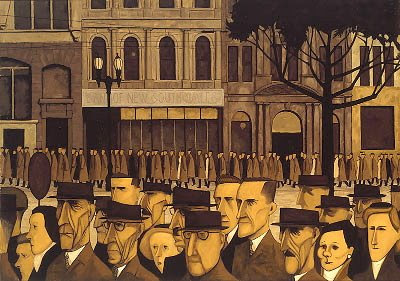 His iconic painting, Collins St 5pm, takes you into his view of the city as he waited for his friend to knock-off work. But more than his bystander sketching you get a soap opera of faces - from the pinching at the eyes of the Henry Lawson lookalike to the plummy cheeks of the woman pushing behind him. And they're all grimly heading in the same direction. The National Gallery of Victoria is currently running a retrospective of Brack's work that sweeps through his career. There's the brief period in 1956 where he headed out to Flemington to paint 'the sport of kings' but came back only with gargoyle jockeys and undertaker punters. He took on Barry Humphries cross dressing as Dame Edna Everidge and captures the strangeness of both. A large part of the motive is... the desire to understand and, if possible, to illuminate. Later Brack seems to have become disenchated with people painting objects - most notably quills and pencils that march and fight in a disappointingly human way. Then he uses postcards to summarise human civilisations in a more abstract style. It's the artist continuing to challenge himself as his career moves on. But for many gallery visitors, it's all about Collins Street, 5pm. There's a rather cheeky piece of hanging here as the piece directly opposite it is The Bar (below). It's set slightly after 5pm as the notorious six o'clock swill means that men are throwing down pots before the pub's early closing times that blighted 1950s Australia. So there's the rush from work and the mania of the pub. Between them, stands this determinedly smiling woman who seems to get the joke of the painting she's in and the one she's facing. (Images courtesy of NGV site, but these low-res shots really don't do them justice - you need to see them to really feel their punch). George, I often think if Brack painted Collins Street now, at 5pm the pedestrians would all be clutching their mobile phones. At 9am they would all be desperately clutching their disposable coffee cups. @JD, you're probably right about the coffee and mobiles, but I think Brack would have risen to teh challenge. He did a lot of pieces about consumerism and the suburbs that are in this collection. Such a great snapshot of a changing Australia. "I moved to Melbourne for a Brack, and all I got was these pick-up sticks." I'd like to go check out that exhibition. Wait, is it over? I am never abreast of these things.